MISSOULA, Mont. 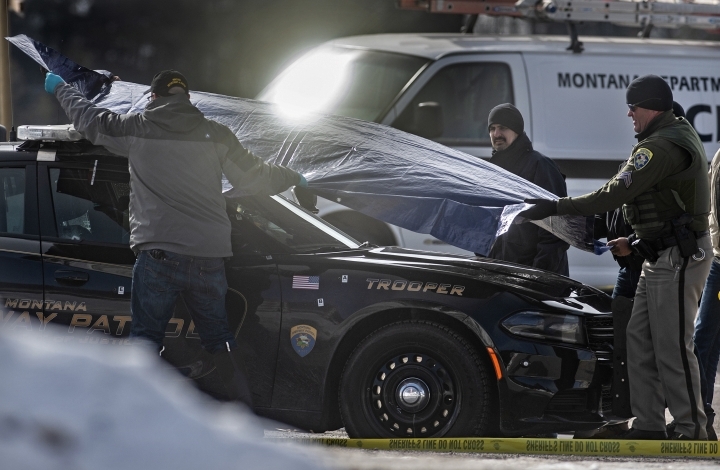 — A Montana Highway Patrol trooper who was investigating a shooting that killed one person and injured two others was himself shot and critically injured Friday after finding the suspect's vehicle, officials said. Authorities later arrested a 29-year-old suspect. 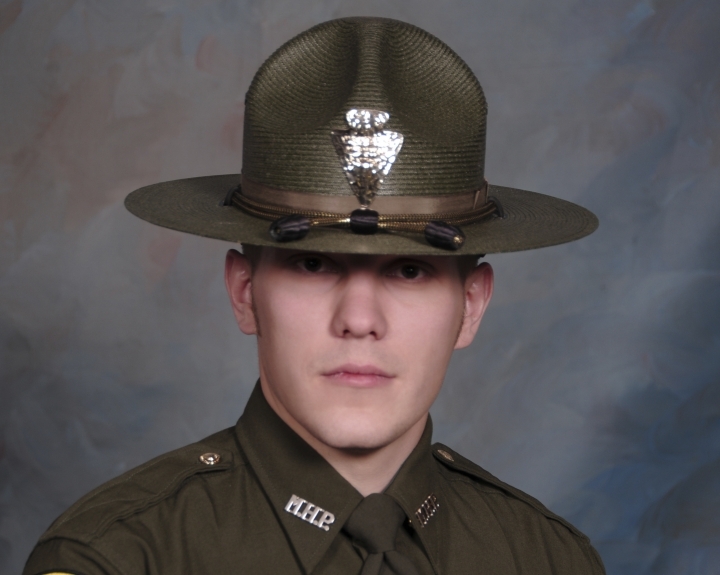 Trooper Wade Palmer, 35, was among the officers searching for the driver of a Cadillac Escalade who flashed his lights at a pickup truck ahead of him and then opened fire on the truck's occupants when it stopped Thursday night in Missoula, according to charging documents. The bullets struck Casey Blanchard and Shelley Hayes, along with Blanchard's mother, Julie, who had driven to a Missoula bar to pick the friends up, Julie Blanchard told investigators. Authorities found Hayes dead in the truck's backseat. Casey Blanchard had been shot multiple times but was conscious and Julie Blanchard also had been shot and was conscious, according to the court documents. Julie Blanchard said the Cadillac followed them from the bar and she pulled over thinking the driver may need help, according to the charging documents filed by Missoula County Chief Deputy Attorney Jason Marks. Investigators said it appeared two handguns and "an AR-15 style rifle" had been used in the shooting. A little over an hour after that shooting, Palmer found the Escalade on U.S. Highway 93 near a bar in the small town of Evaro about 10 miles (16 kilometers) away. Palmer reported to dispatchers that he was under fire, and then didn't answer his radio, Marks wrote. Another trooper arrived and found Palmer wounded and still buckled into his patrol car, a statement from Montana Highway Patrol officials said. The shooter had fled. 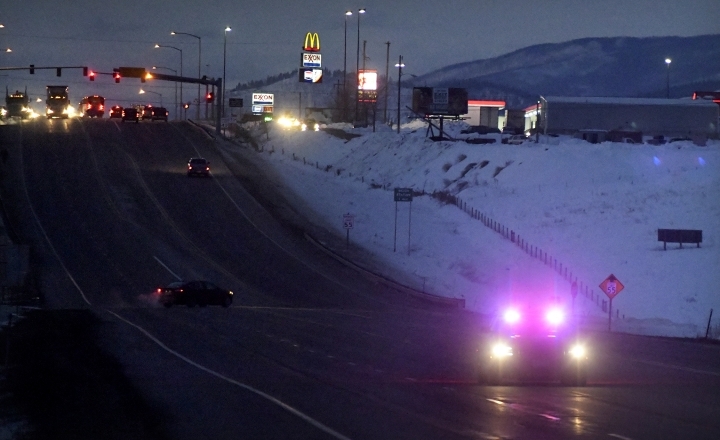 Police shut down that stretch of U.S. Highway 93, warned residents to lock their doors and then spent hours searching before they arrested Johnathan Bertsch at about 6:15 a.m. He has been charged with deliberate homicide and three counts of attempted deliberate homicide. He was being held in the Missoula County Detention Center, and it was unclear whether he had a lawyer. He is scheduled to appear in court on Monday, Marks said. Palmer initially was taken to a Missoula hospital, where he was listed in critical condition. Dozens of patrol cars crowded the hospital's parking lot as officers from various law enforcement agencies gathered to pay their respects, and they later joined a motorcade that accompanied Palmer to the airport to be transferred to a Salt Lake City hospital for treatment. Authorities found Bertsch with the help of his father, Burton Bertsch, who said his son had called him and told him, "I had a road rage incident. ... I think I might have shot a cop," according to the charging documents. Authorities spoke to Johnathan Bertsch using Burton's phone, but he refused to tell officers where he was. They found him after someone called 911 to report the Cadillac parked at the bottom of the driveway along a road near the bar, documents said. Palmer has been a trooper since 2012. He has a wife and two children, and he won the law enforcement agency's highest honor, the Medal of Valor, in 2015.